This is the Third version of LK Magazine Blogger Template Series.These template is by "Premium Templates" Has corrected many weaknesses of LK magazine v2 blogger template and add some features from Prozine Blogger Template to this template.To configure this template correctly, read the instruction given below.Like LK Magazine v2 blogger template,I think you will like this blogger template very much.The features of this template as given below. Auto Read More Feature with Thumbnails. 468*60 Header Logo with the PSD file and Fonts. 1 Multi Tab View Widget installed. 1 Featured Auto content slider installed. Hosted images on blogger. Free use forever! 1.First download the template and unzip the file. 2.Now, sign in to Blogger dashboard and click on the layout. 3.Here is the important step, after uploading any new Blogger template, all of the previous widgets like your google adsense ads,text,profile,poll,etc etc will be lost. So, to avoid this to happen, in this step click on 'edit' on all the widgets and copy the codes into notepad,etc. 5.First of all please Download Full Template.This is to back up your present template.If the new template that you are going to upload makes/gets into some errors or if you make more complex errors in that,then you will loose everthing.So make sure that you back up your template. 6.Just below that,there's an option of uploading new template.So, use the Browse button and upload the downloaded xml file. 7.Now, a message appear saying that your widgets are about to be deleted.Click on the Confirm & Save (no problem doing this because we already copied the widget codes in Step 3). 8.Now click on "confirm and save".Now you successfully installed the template. 8.Click on the 'Page elements' page now and add the codes that you copied in step3 using the 'Add a Page Element' option. Replace DESCRIPTION HERE,KEYWORDS HERE as below. KEYWORDS HERE:Write the keywords of your blog separated by comma. Now Replace Your-Link-Here,Link-Title,Link-Name-X with your details. Now replace it with your logo address/url. your-twitter-url, your-facebook-url, your-delicious-url, your-stumbleupon-url, your-linkedin-url,your-contact-url, YOUR-FEEDBURNER-ID with your details. ENTER-TAB-1-CONTENT-HERE, ENTER-TAB-2-CONTENT-HERE, ENTER-TAB-3-CONTENT-HERE with your contents. Now replace "YOUR-FAVICON-URL" with your Favicon address/url. Please do not remove the footer credit. 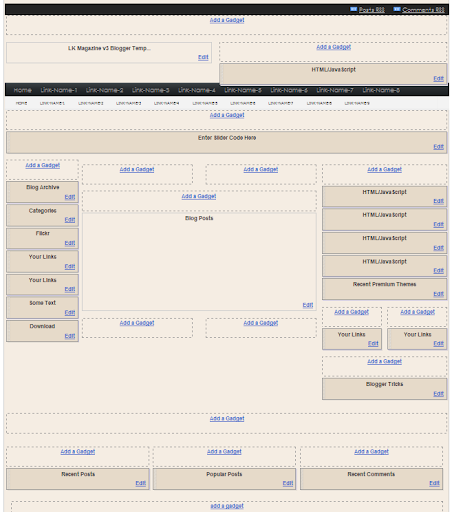 I spend several hours to create this blogger template. So that you can use it for your blog. All I ask is, stay the credit intact. 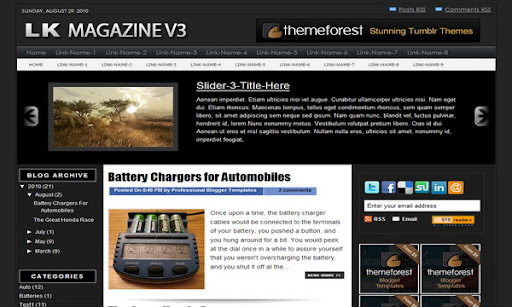 This free Blogger template is licensed under the Creative Commons Attribution 3.0 License,which permits both personal and commercial use. Please Pass Your Valuable Feedback Through Comments....!